Welcome to Part Three of our Home for the Holiday series. In case you missed it, see this gorgeous Modern Woodsy Wreath and the beautiful Whimsical Winter Mantel tutorial by Alison O’Rourke and Allison Maucere, longtime friends and Chick-fil-A designers who have a passion for making everyday life just a little more beautiful. 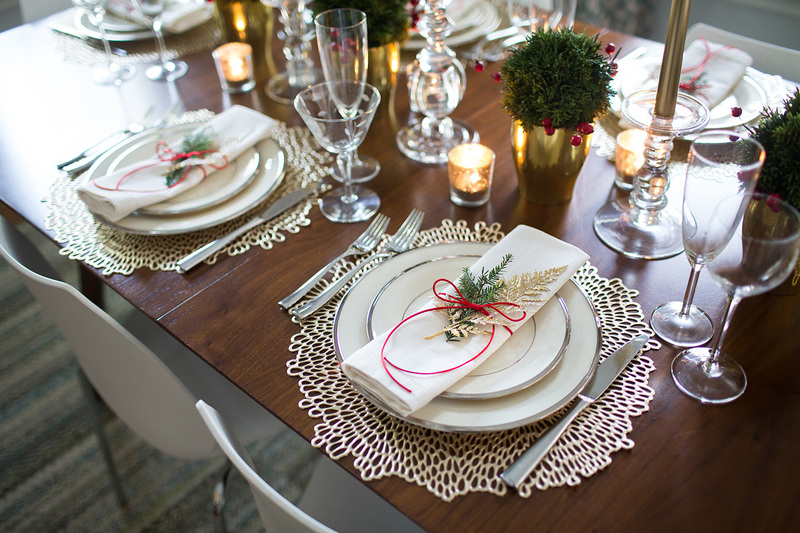 The front door is festive, the mantel is eye-catching, and now it’s time to set the table. 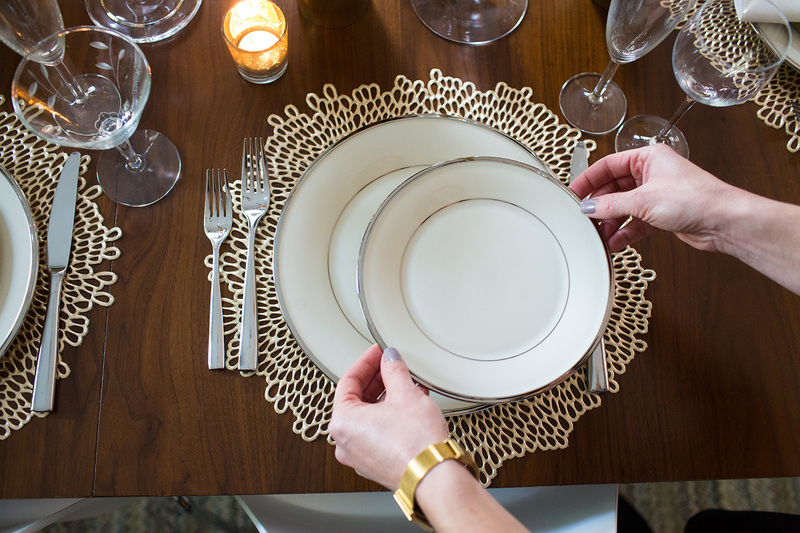 O’Rourke recommends following a few design principles when setting the table: color, texture, layers, and height. Step 1: Start from the bottom up. O’Rourke suggests foregoing the tablecloth and using gold placemats or paper doilies instead. Layer solid colored plates on top, and don’t be afraid to mix and match colors, like white and ivory or gold and silver. Mismatched flatware and stemware can add an eclectic touch. Step 2: Add some texture. 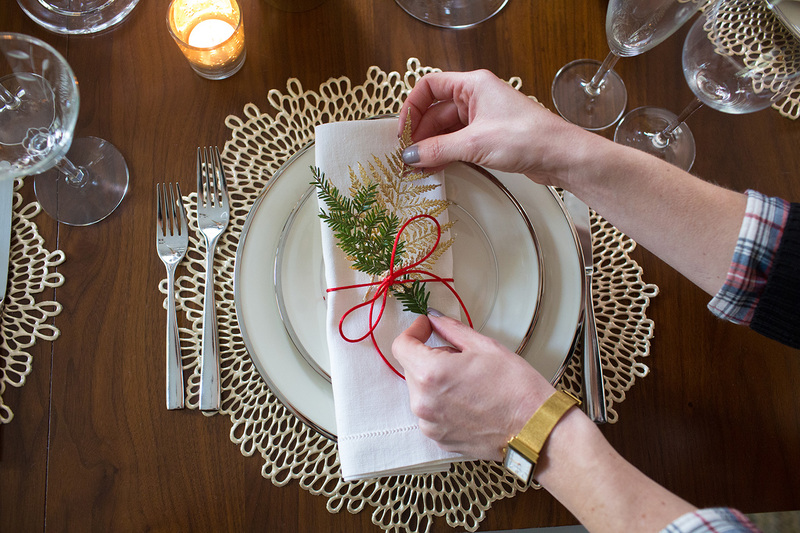 Fold the napkin into a rectangle, tie it with a simple red ribbon, then embellish with faux or fresh greenery. Step 3: Create height and sparkle with a centerpiece. O’Rourke recommends two to three tall candlesticks contrasted with short gold vases filled with greenery and berries that add a pop of red. Next: The Allisons show how to make a simple card display in Part Four of our Home for the Holidays series.